If there is one thing we’ve learned, is that behaviour change is a concept that needs to change. And for good reason… changing the world means needing people to change how they do things. The problem is, that’s all fine and well when you’re the one doing the changing but what if you’re the changee? I don’t know about you but I don’t want my behavior changed. I’m quite happy with it like it is, thank you very much. What’s more, if you try to change my behaviour, I might just find that offensive, and then I won’t change – just to prove a point. So, I dig in my heels, no-one changes and the problem remains. The way we see it, creating change in the world is not about changing people’s behavior, but about creating community around good behaviours that already exist. This principle is best explained with a couple of examples and help from our adapted version of Integral Theory, by Ken Wilbur. 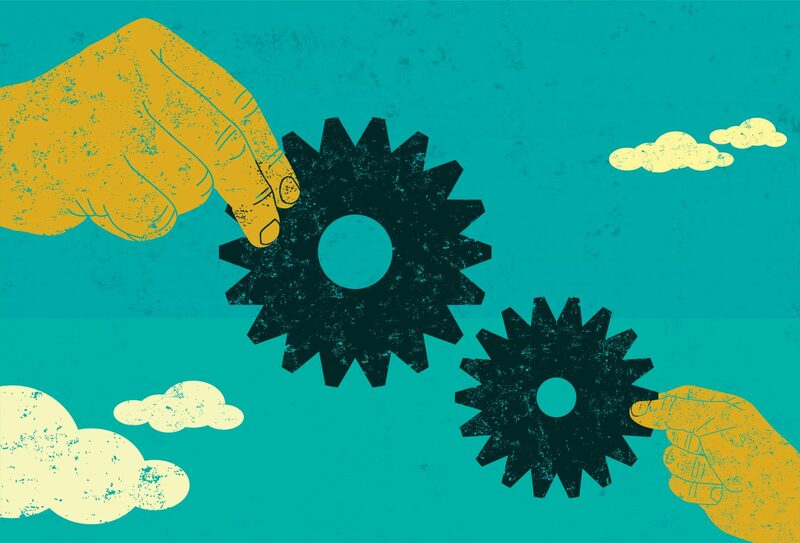 It says that you need a combination of internal, external, individual and collective factors to make change happen. We like it because it’s simple, and it works. And you end up with something like this. Classic advertising. Find the benefit – make an ad. It seeks to change my individual, internal perception of cycling by giving me a reason to do it. Person two says, ‘Nah. I already know that. The problem is, I haven’t ridden a bike in years. Why don’t you put some bikes in a park encourage people to ride across instead of walking. This is classic product demonstration. It changes the external factors stopping me riding a bike by showing me how to do it. Person three says, ‘No no no, that’s all fine. I can already ride a bike. The problem is I feel like a twit if I’m the only person riding. What you need to do is create group rides so I can feel like I’m not the only one doing it, and other people see us and join in.’ Which is where you get ideas like the Tweed Ride, night rides and of course, nudie rides. This is fashion and recommendation. It changes my internal perception of how cycling is accepted – and therefore how I’ll be accepted by showing me others doing it. This is a collective need for real, external infrastructure that makes it easy to ride a bike. So, who is right? Well, wisdom would say everyone. And that would be a good theory of behaviour change. But we’re thinking, in many cases, there’s a better way. Let’s pick a different problem – street side waste. One look around your average urban neighbourhood and you could be forgiven for thinking that old drawers, stereos, clothes racks and kids’ bikes grow on the nature strip. One day we decided to take this problem on. But not by talking to people about waste. Instead, we thought, if there was a better second hand market for this stuff then maybe it would be just as easy for to people to sell and redistribute it, and make a few bucks, as it is to dump it. 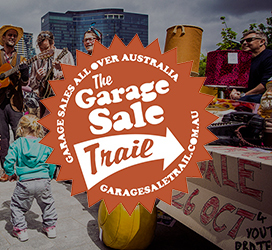 The result was the Garage Sale Trail – a national campaign encouraging everyone in Australia to hold a garage sale on the same day. A website makes it easy for people to list their garage sale, or find garage sales they want to put ‘on their trail’. All media and advertising talks about ‘finding the treasure in your neighbourhood’ and showcases great sales and finds. Nowhere do we talk about waste and we certainly don’t need to show people how to hold a garage sale. The Garage Sale Trail is now in its 6th year. It reaches half the Australian population, has helped find new homes for over 3 million items and launched in the UK for the first time in 2015. So what does all this mean for behaviour change theory, at least the one described above? What we’re trying to do here is stop people throwing away stuff that still has value. Yet we never mention that. There’s no classic problem/solution setup. We don’t give any rational or emotional reason to stop people throwing stuff away – we don’t really mention waste at all. What’s more, we don’t need to tell people how to hold a garage sale. So there is no; ‘show me how’ product demonstration. In fact the whole top half of our change theory – the part that most resembles how advertising does things – is, in this case, unnecessary. It’s all about the bottom half – the collective. Community and role models make an old idea the new cool thing to do. Infrastructure like websites and toolkits make it easy. And it works…with half the effort. Sometimes changing behavior doesn’t mean directly talking about that behavior. If, instead, you can find an existing behaviour that is already proven to help solve your problem, then spread that behavior by making it fun and social, that can be a far more effective method of solving a problem than those commonly employed in so called ‘behaviour change’ campaigns. And I, for one, think that’s a far more enjoyable way to change the world anyway. By Ben Peacock, Founder of Republic of Everyone. Here at Republic of Everyone we work with sustainability leaders and give them the tools to make doing good, good for business. Do you need help with your Shared Value/CR/Sustainability strategy, engagement, reporting or initiatives? 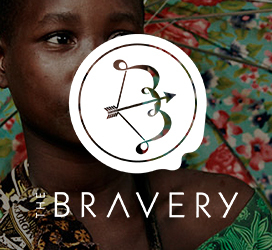 Call us +61 2 8097 8746, email ben@republicofeveryone or drop us a line below.